Zebrasoma and leucosternon are from the family of Acanthuridae, they are the most colorful bright reef fish in the ocean, they are found usually around coral reefs around the globe and are very popular in the aquarium trade. 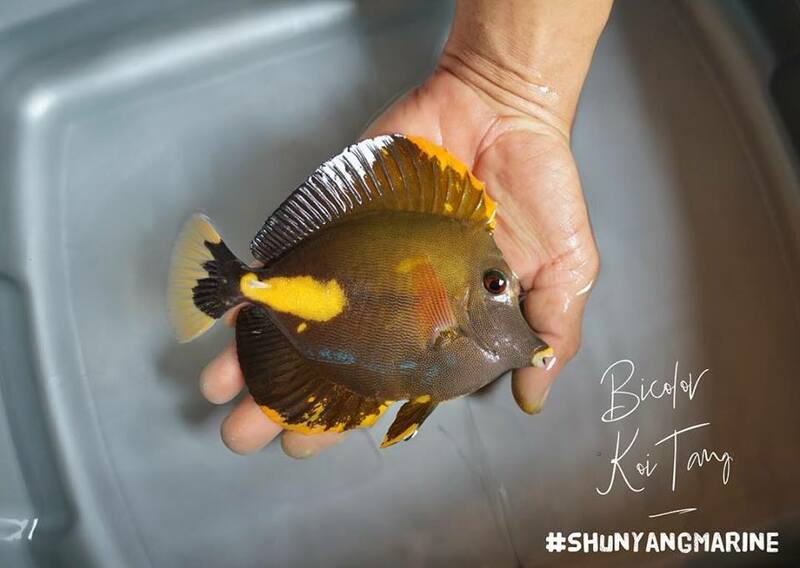 Tangs are the first choice when it comes to stocking our aquarium and here we have a hybrids from Shunyang Marine from Jakarta. This one has some excellent bright colors with stunning personality. With the colors of yellow, orange and grey the Zebrasoma Koi Hybrid Tang look absolutely stunning. This specimen looks like a cross between (Z. flavescens X Z. scopas). As we are only guessing by the colors and shape. Hybrids usually has a mix of color from both the parents. Although some hybrids are not very common and are considered as rare specimens. For two fish species to hybridise, they need to be very closely related in the gene, even then there’s not always a guaranteed of a cross. Finding hybrids in the marine fish trade is becoming far more common compared to earlier time. This specimen is commonly being called as the Bicolour Koi Tang referring to the fresh water koi’s. This specimen is A. leucosternon X A. nigricans which also carries the colors and white cheek from both the parents. We are yet to see more of the hybrids in the marine aquarium trade and there are lot of speculation around them, but in coming times we will see the fate of hybrids.